A serious attention call today for all those who doubt that boating (or even mariner) skills of Paleolithic peoples could even exist at all. Timorese people were fishing tuna, a pelagic fish, requiring certain serious mariner skills, some 42 thousand years ago, roughly when their distant relatives were making their first incursions into ‘the Neanderlands’ of West Eurasia. 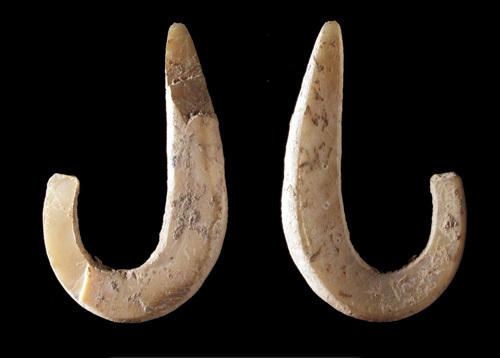 The ancient Timorese people who dwelt in Jerimalai shelter used elaborate fishing hooks, which are however dated to c. 23-16 Ka ago. These hooks were worked out of shells. With or without hooks, they fished a lot of tuna and parrotfish which are clearly dated to c. 42,000 years ago. These fish can’t be captured from the shore. Sue O’Connor et al., Pelagic Fishing at 42,000 Years Before the Present and the Maritime Skills of Modern Humans. Science 2011. Pay per view. Media/blog articles: New Scientist, Adelaide Now, Dienekes.